Today I've been to the National Marine Aquarium in Plymouth, Devon where they have loads and loads of really interesting fish to look at. 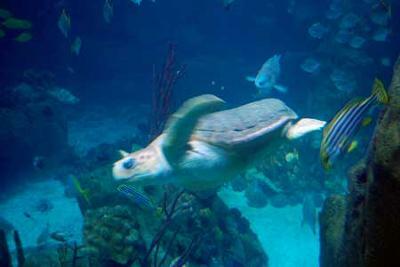 There are three enormous reef tanks that contain fish of all shapes and sizes. One tank has an old aeroplane that was put there as an artificial reef for the sharks, rays and other fish to swim around and make their homes in. The middle sized reef tank is a coral reef and swimming around in amongst all the colourful fish was your cousin Snorkel. She is a leatherback turtle who lives with all the fish and keeps them all in order. It was quite difficult to take a photo of her because she moves really quickly through the water, so I've sent you the best one. You'll see her front flipper is a bit blurred, this is because the light levels are quite low so as not to hurt the eyes of the creatures that live in the tank. Thank you Auntie Lesley for your wonderful picture of Snorkle! I am going to make the link to Snorkle's site live so other people can see it, too. I'm glad Snorkle has her own Web page, but I have my own whole SITE! I guess she is too busy swimming around and letting people look at her to build a Web site.